One of the Seven Wonders of the Ancient World, it was completely rebuilt three times before its final destruction in 401 AD. Only foundations and sculptural fragments of the latest of the temples at the site remain. Bird’s-eye view of the Temple of Artemis or Artemision. The statues represents wounded Amazons. A drum from the top of a column from the 4th-century rebuilding, now in the British Museum. Close-up of the column bases. The site of the temple now. One column was partly re-erected in 1973. Tecam, a Spanish publisher asked me to virtually reconstruct the famous Celsus library. 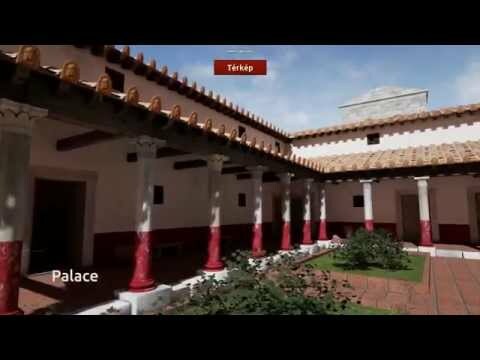 The rendering of the library will illustrate the Ephesus part of the book series ‘La aventura de la arqueología’ from Tecam, RBA, National Geographic. Virtual reconstruction of the Celsus library, close-up of the entrance. Virtual reconstruction of the Celsus library, close up of the statues on the first floor. The Aquincum legionary fortress was one of my first virtual reconstruction. The publisher of the book selected the reconstruction of the southern gate overlaid on the photo of the ruin of the gate as the cover of the book. English Heritage choose one of my earlier reconstruction for an interpretation panel in Chesters Roman Fort. The image was made for the Aquincum Anno booklet in 2012. Leading archaeologist Olivér Gábor wanted to visualize the history of Pécs for a long time. He contacted me in 2012 to talk about a virtual reconstruction of Sopianae at the end of the IV. century AD. We wanted to show not just the grand and luxurious side of the city, but also the everyday life of the average citizen. The visitor should walk freely in the virtually reconstructed city, discover the scenes in his/her own pace. The work started in the end of 2013 with collecting the available data, publications, photos, drawings. Map of the excavation at Teréz street. 21 objects, coins, glasses, samian wares, iron tools destined for showcasing both in the permanent exhibition and in the reconstruction were photographed from all angles to aid the 3D modelling process. Out of 8 possible scenes a palace, a city house with bath, and a square with a granary and shops were chosen for the first round. Square with the granary and shops. Palace of a wealthy man. Visitors can control a virtual time traveler, walk and look around like in an fps video game. In the vicinity of a featured artifact an outline indicates that it is clickable, if done so the screen changes to a showroom with the enlarged object and it’s description. Characters were based on real life people. There were 258 models, 323 textures, 233 materials made for this project, all from scratch. Aerial view of the amphitheatre.